After hiking Sugarloaf and Spaulding the previous day, my ankle was sore and I wasn’t positive it would be up for another day of hiking. Not wanting to sit around camp all day, I wrapped my ankle tight and Michael, Jeff and I headed to the Bigelows. The Bigelows are a long range of mountains found south of Flagstaff lake in the Bigelow Preserve. 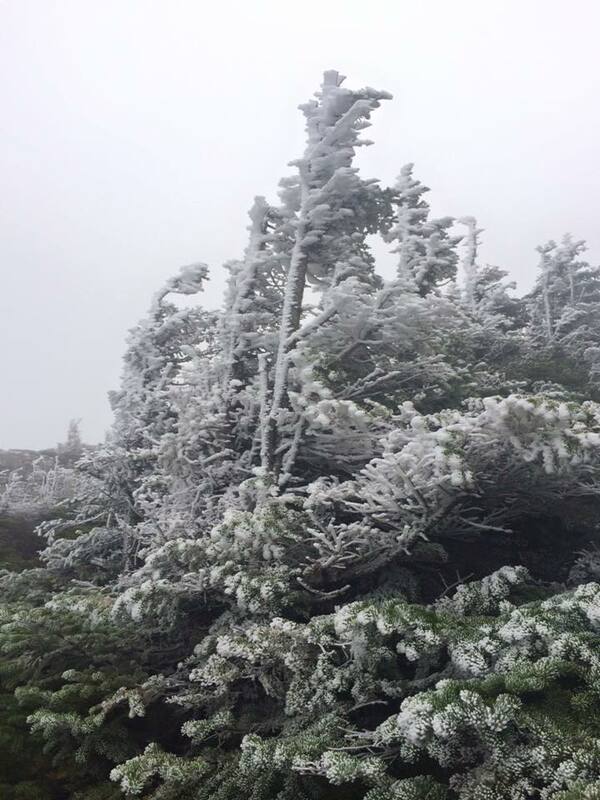 The range has two New England 4000 Footers and a New England Hundred Highest, all of which we planned on tackling. 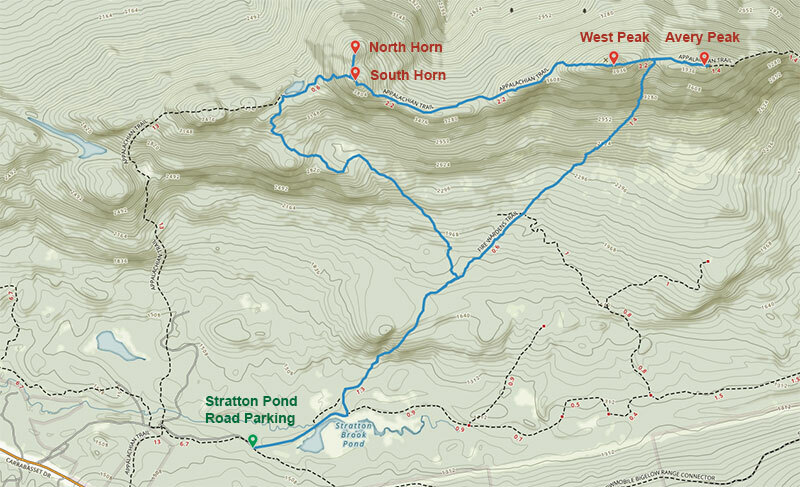 To get to the standard route for hitting all of those peaks, we took Stratton Brook Pond Road off Route 27 and parked at the last lot before the road turned left toward Stratton Brook Pond. The standard route was a lollipop loop up the Fire Warden’s Trail to Avery Peak, then west across the Range Trail to West Peak and The Horns and at Horn Pond Shelter taking Horns Pond Trail back down to the Fire Warden’s Trail. The hike was nearly 14 miles and 4000 feet of elevation gain and by the end I wanted to amputate my left ankle. We got to the parking lot at 8:30 am and headed up the Fire Warden’s Trail. 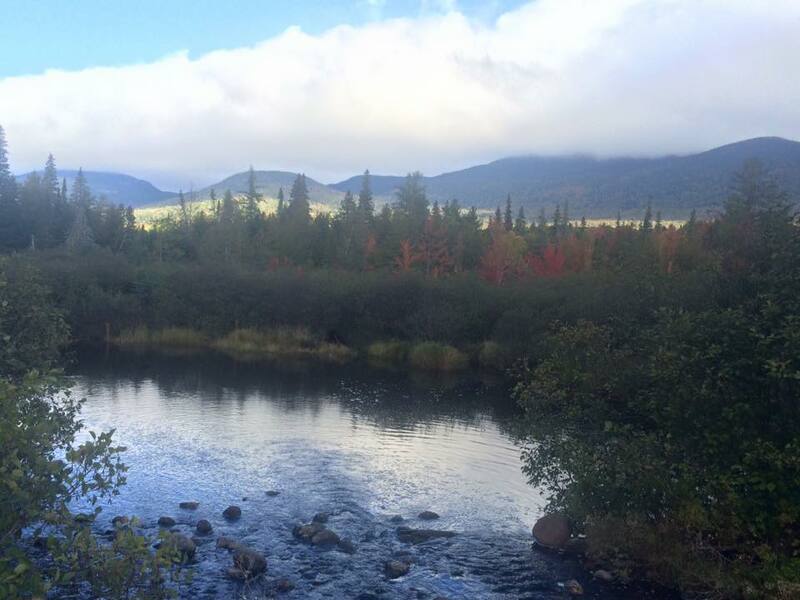 The trail started off very level and passed across a bridge and along Stratton Brook Pond. There were a couple of campsites along the trail which would make for an excellent camping trip. The climb up Fire Wardens Trail became more and more intense as we approached the col between Avery Peak and West Peak. Shortly below the Myron Avery Tentsite situated in the col we hit freezing temperatures and the trees and trail frosted up. At the intersection with the Range Trail we turned right and made our approach of Avery Peak. Above the treeline much of the scenery was covered with hoar frost. 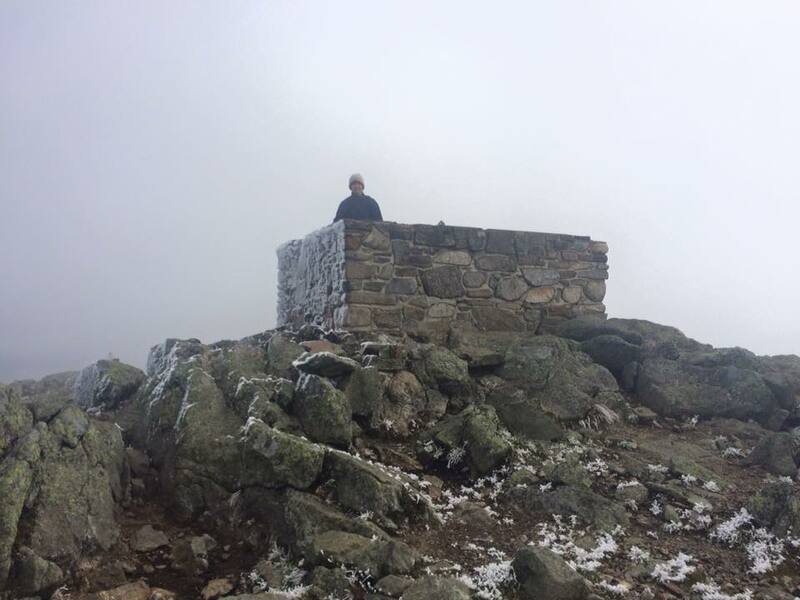 We climbed the rocky summit and reached Avery Peak at 11:45 am. There was a large group of people on the summit when we got there but they soon left in order to escape the cold and wind. They were nice enough to take our photo before departing. We continued east on the Range Trail for a short distance and took shelter from the wind in the foundation of a bygone fire tower. We had a snack and then started west toward West Peak. As we hiked toward West Peak the clouds started to break up and we had occasional views. To the south we got a hint of Carrabasset Valley and Sugarloaf Mountain, and to the north the sprawling waters of Flagstaff Lake. Range Trail dropped down below tree line in the col between the two peaks and then quickly rose above the trees again as it approached West Peak. 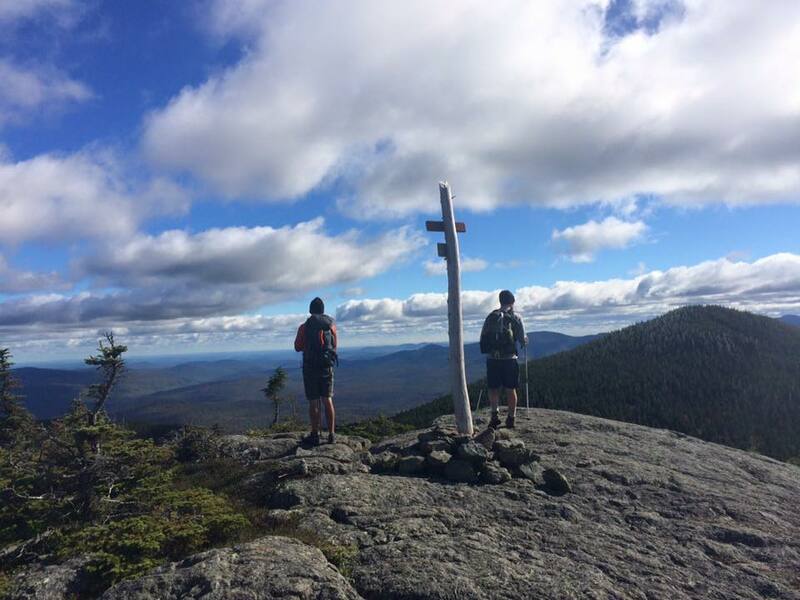 The 0.7 miles between the two peaks had to be one of the more impressive views in all of Maine. We got to the West Peak of Bigelow at 12:30 pm and continued on toward The Horns. From West Peak we could see the twin peaks of The Horns to the west and the elevation loss between. The trail dipped into the saddle between West Peak and The Horns. Michael and I took our time with the moderate descent and ascent while Jeff forged ahead. My ankle was again giving me grief so I appreciated the lack of aggressive trail. The trail quickly rose and crested out of the tress at South Horn. We got there at 2:00 pm and found Jeff resting in the sun. South Horn had a nice view down to Horn Pond and the surrounding area. Even though South Horn was the taller of the twin peaks we took the short hike over to North Horn as well and got there at 2:20 pm. From North Horn it was all downhill to the car. At the junction with North Horn Spur and Range Trail we were visited by a Gray Jay which was willing to eat off of Jeff’s head. We climbed down to Horn Pond, not stopping just bypassing it, and continued down the Horn Pond Trail. The hike down became a slog for me as my ankle hurt more the further we went. By the time we got back to Fire Wardens Trail for the last couple of miles, I was limping and had to take it slow. The repeated trail back to the car was mostly uneventful, but that didn’t mean there was nothing worth looking at. We got back to the parking area at 5:30 pm and headed back to our campsite. 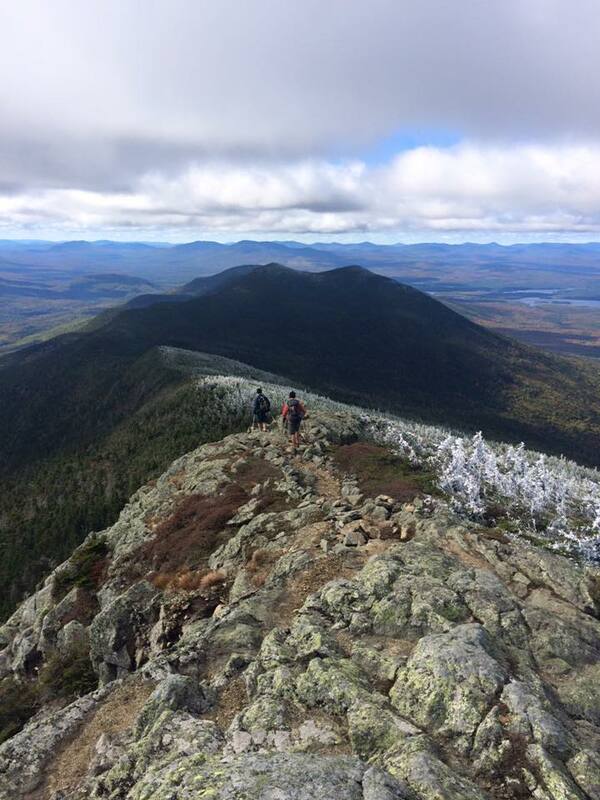 Bigelow Range was definitely one of the most interesting and impressive hikes I’ve done in Maine. It was a rather long and strenuous hike, but there were plenty of shelters that could be used to break it into a mult-day hike. I was hoping that we were going to get a third day of hiking in, but the next morning we packed up and headed home. My ankle was grateful for the rest. “Bigelow Preserve.” maine.gov. inforME. Web. 18 January 2016. 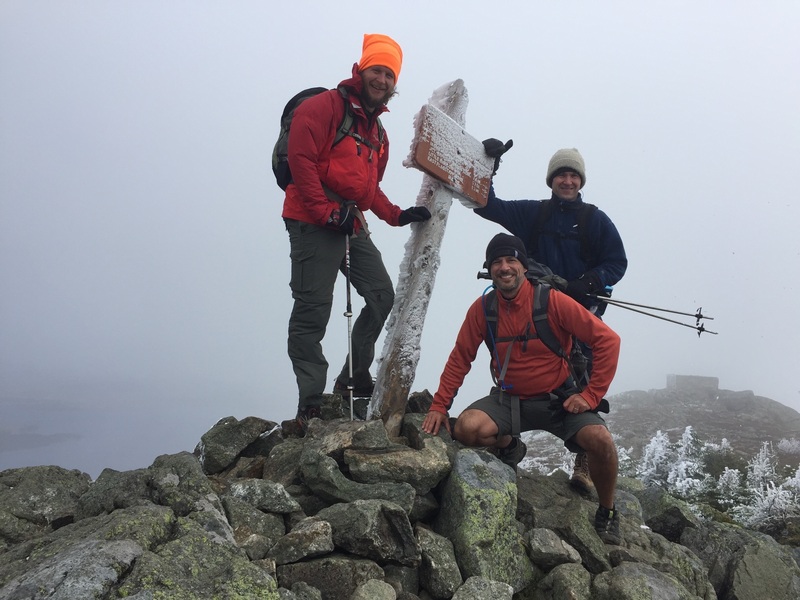 This entry was posted in Hike and tagged 4000 Footer, Avery Peak, Bigelow Preserve, Carrabassett Valley, Flagstaff Lake, Hike, Horn Pond, Hundred Highest, Maine, The Horns, West Peak. Bookmark the permalink.